We’ve just updated Displays to version 1.6, our app to change resolution on Mac and manage monitors. This version adds a lot of features for taking screenshots. First of all, when you take a screenshot, a new sharing window is now opened by default, as shown below. Inside this window, you can preview your screenshot and share it easily: either to an hosting service or to any other app installed on your Mac (we’re using the macOS sharing facility). In addition to Cloudapp and Dropbox, already supported, we’ve added OneDrive, Google Drive and FTP server support. The other improvement is screenshot edition and annotation: directly in the sharing window, you can resize and crop your screenshot. 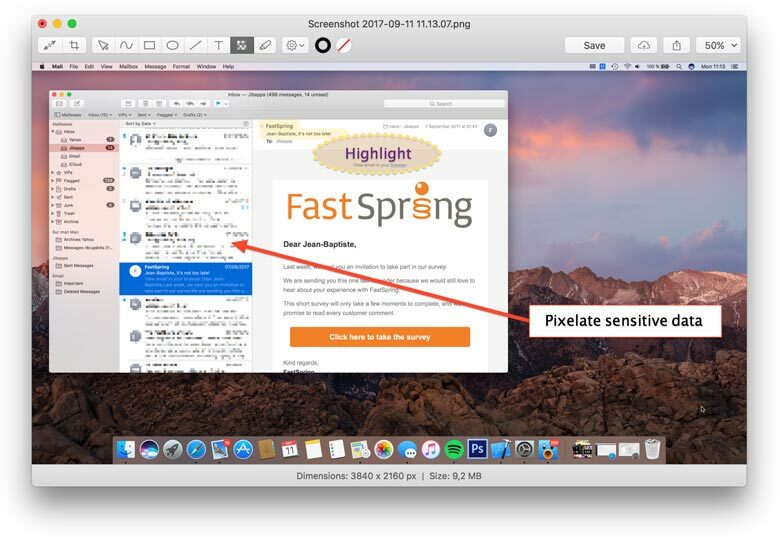 We’ve added a lot of useful tools to annotate your screenshot, like drawing rectangle/circles, lines, free drawing, text, highlighter and even a blur/pixelate tool to hide sensitive data. Last, we improved support for video card switch. MacBooks Pro and iMacs have two video cards, one called integrated (Intel) and the other one dedicated (Nvidia or ATI) ; macOS switches to the best video card, according to its needs. We’re now displaying the actual name of the video card in use, instead of just « Integrated » or « Dedicated ». And we’ve also added a notification when macOS is switching video card in use (enable this notification in Displays preferences, as this is turned off by default).